At A Pet Palace we treat your pets like kings and queens at our palace. We are locally owned and operated in Rio Rancho. We offer the highest quality of service and customer service. 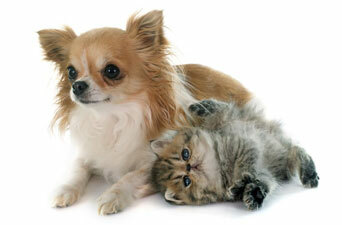 Pet Palace Groomery offers affordable and gentle dog and cat grooming services in Rio Rancho, NM. Our team is full of experienced groomers and handlers who know just how to comfort your pet and make their day relaxing and enjoyable. We want your pets to love coming to see us, and we know that they will feel beautiful strutting out our doors with one of our specialty cuts! Our pet grooming services include not just haircuts, but also nail clipping and custom accessorizing. Your pet will be the belle or beau of the ball with our professional, quality grooming products and accessories in their fur. Stop by our salon today to check out what our stylists can do for your dog or cat! At Pet Palace, we are a pet grooming shop that provides caring services with the attention and love that your pet deserves. We strive to make your pet's experience as comfortable as possible so you can feel confident that they are in good hands. We look forward to meeting you and your pets! We are open from 8:00 AM until the last dog leaves! Tuesday - Saturday.